The spire in Dublin is a 400ft stainless steel needle pointing skywards from O’Connell Street, near to the General Post Office. Although there was controversy over its cost, delays in construction and merits when it was installed, we think it’s one of the best bits of public art we’ve seen around the world. There are a few things to note about the Spire. First, it’s much wider at it’s base than it is higher up – just like a needle. The diameter at the bottom is around 10 feet (3 metres) wide, but at the top it’s only a few inches. This means that when put your head against it and look up, you can see the top of the needle moving around, especially if it’s windy. Also, it has a highly polished reflective surface, which means it reflects the buildings around. At night, it’s also worth seeing, because it’s illuminated and can be seen all around the centre of Dublin. 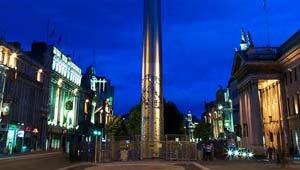 The Spire, which is also referred to as the Spike by some Dubliners, was completed in 2003 and stands on the site of the old Nelson Pillar which was destroyed in 1966 after an IRA bombing. It was designed by Ian Ritchie Architects as a Millennium project for the redeveloped O’Connell Street. Other notable landmarks nearby include the attractive GPO building which was the scene of the 1916 Easter Rising and the likeable statue of the Irish union leader Jim Larkin.